Searching for Local Windmill Repair or Installation Service in New Mexico? A professionally-executed windmill installation from Williams Windmill can provide a reliable and free source of energy for all your water pumping needs, as well as impressive amounts of power for your water hauling efforts. Their simple yet durable design is ideal for use on farmland or any open plain throughout New Mexico. Our highly trained windmill technicians at Williams Windmill can also provide effective and efficient repair service for your onsite equipment. 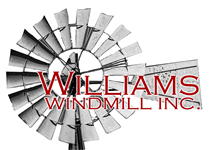 Although it’s possible to perform some repairs yourself, most are best left to professionals like Williams Windmill Inc. Because each windmill contains moving parts exposed to the elements, it’s also important to protect your investment and schedule preventative maintenance for your windmill to ensure you’re always up and running. We’re available to perform inspections and provide an accurate assessment of your windmill needs to prevent downtime from harming your livelihood. If you have any questions about windmill installation and repair, or if you would like to discuss your windmill system needs with an expert, contact us at 575-835-1630 today. Williams Windmill Inc. provides windmill installation services to Albuquerque, Tucson, Las Cruces, Santa Fe, Roswell, Carlsbad, Socorro, Lemitar, and surrounding NM and AZ communities.